Continuing in our overview of key chiropractic digital marketing terms, we’re going to discuss six more topics. If you missed the first post or just want to check it out again, then you can read it here. Digital marketing can seem complicated but it really doesn’t have to be. Let’s go through this together so that you can use these tools to get more new patients from the Internet. In marketing, a call-to-action (CTA) is an instruction designed to provoke an immediate response. In other words, tell your website visitors what you want them to do. An easy way to accomplish this with your website design is to include a constant “Contact Us” banner button that appears on the header of every page. 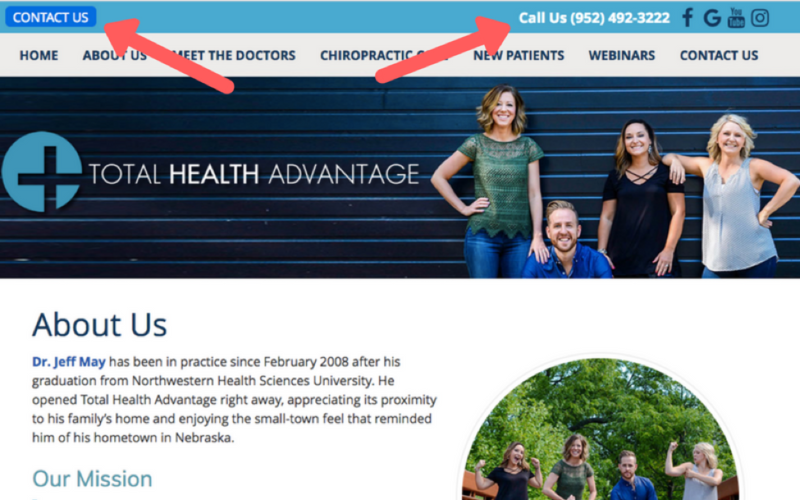 Here is a chiropractic website with this clear call to action on every page. Domain authority is calculated by evaluating several factors – root domains, total links, domain age, etc. Domain authority essentially determines your practice website’s Google rankings and therefore the number of new patients you can get from the Internet. It help’s Google determine whether or not they can “trust” your domain. Here is a free tool you can use to evaluate your domain’s authority: https://moz.com/researchtools/ose/ . Name, Address, and Phone Number (NAP) are key elements for promoting a local business on the Internet and are important elements of Google search results for local businesses. The consistency of your NAP data across the Internet is important. Google needs to be able to trust your website with the traffic it sends your way in order to keep the loyalty of its users. If Google is not confident in the information they have on your business, they will not show it in the results pages. They don’t want to risk losing a consumer if the information is wrong. So, what if you have set up your Google My Business listing (more on that below) and your NAP data is all perfectly fine and correct but Google is still not showing your business in the results? This could be because your practice is listed on the local chamber of commerce website with an old web address. Naturally, it doesn’t penalize the practice, but it may cause Google to doubt the authority of your website, compromising your ranking in the organic listings. One of the many reasons why it is so important to have an experienced chiropractic SEO provider who can track these listings down and make sure your NAP data is correct. Pay-per-click (PPC) is Internet advertising used to direct traffic to websites. Rather than “earning” visits to your site, PPC is “buying” visits. PPC advertising is mainly through Facebook and Google AdWords. While organic visits to your site are, of course, important, PPC is a great way to kick start the traffic to a new site or target admitting complaints for which your website can’t rank. PPC advertising should always be conducted as one part of the larger chiropractic digital marketing whole. Comprehensive strategies that work in harmony with your website, social media, and email will attract more of your ideal patients. Click-through rate (CTR) is the percentage of people who click on your ad or link as compared to the total number of people who saw it (impressions). Before determining whether your chiropractic digital marketing campaign was a success or not, it is best to always check the CTR. A tool for businesses and organizations to manage their online presence across Google, including search and maps. A Google My Business profile is what enables your local business to show up in searches. These listings make sure your practice can appear on Google Maps and the local pack results on the first page. If you don’t claim your listing and ensure all the information is accurate, you will lose out on getting more new patients from the Internet. It is critical that your name, address, and phone number are accurate and reflect what is on your website as well. Are your opening hours listed and accurate? Google often displays listings according to opening hours so make sure these are up to date. What images are on the listing? Consider uploading your own hi-res images to your Google My Business listing to make it stand out amongst the competition. Ready to dive a little deeper? 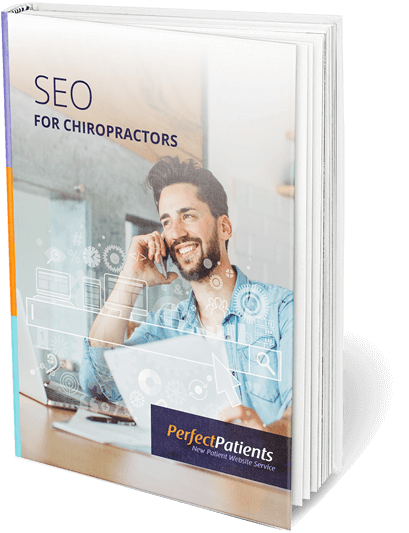 Check out our free eBook on SEO for Chiropractors where you’ll learn more lingo you need to know and the tactics you can use to grow your chiropractic practice with digital marketing. Click here to download your free copy today.